Hello and welcome aboard our Australasian Close to My Heart Blog Hop featuring one of the new paper ranges from the Annual Inspirations book which came out on the 1st September- Nevermore. 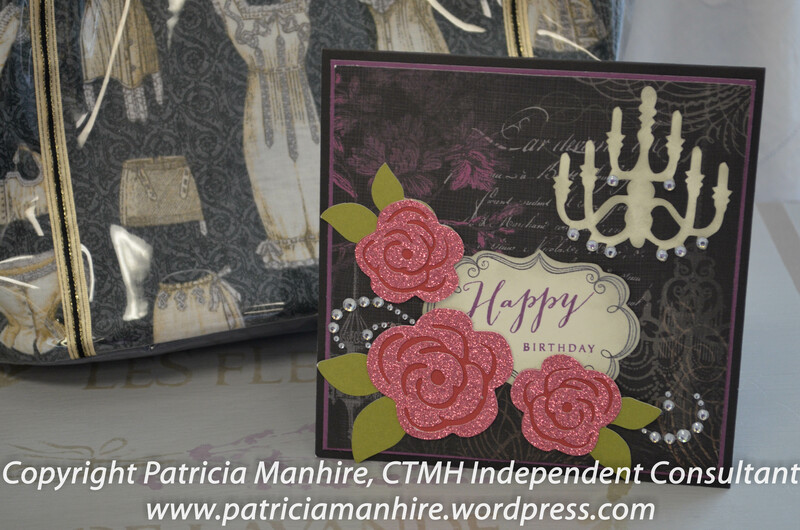 If you have arrived here from Lauren’s Blog, CTMH Craftings, then you are in the right place. If you landed here by accident, no problem, please join in by following the link at the end of this post. I really wasn’t sure about this paper range as it is more for Halloween projects and we do not really celebrate Halloween in New Zealand. However, when I saw this gorgeous gothic looking paper I immediately thought French. My daughter had an amazing holiday in Europe a couple of years ago and took some fabulous photos of the Eiffel Tower and I thought straight away of using this paper to do a layout for them. However, I have not been able to get the papers in time to do the layout so I practiced with the smaller sample size of the paper to make a card (please come back to see the layout with the photos of the Eiffel Tower). Note to self do not match colours late at night when I am tired and it is dark. I cut the flowers out of Pomegranate, Fern and Pink Glitter paper late at night and then realised the next morning that the paper actually coordinates with Eggplant. However, I was happy to leave the colours as the flowers stand out really well from the darker background. The chandelier has been cut out in Colonial White cardstock from the Artiste cartridge and sponged with Whisper ink to create an aged look. I then put some sparkles on the drops of the chandelier to add some bling and make it a little more realistic. The label has been cut using the Art Philosophy cartridge and stamped using a stamp from the Frame Flair stamp set. 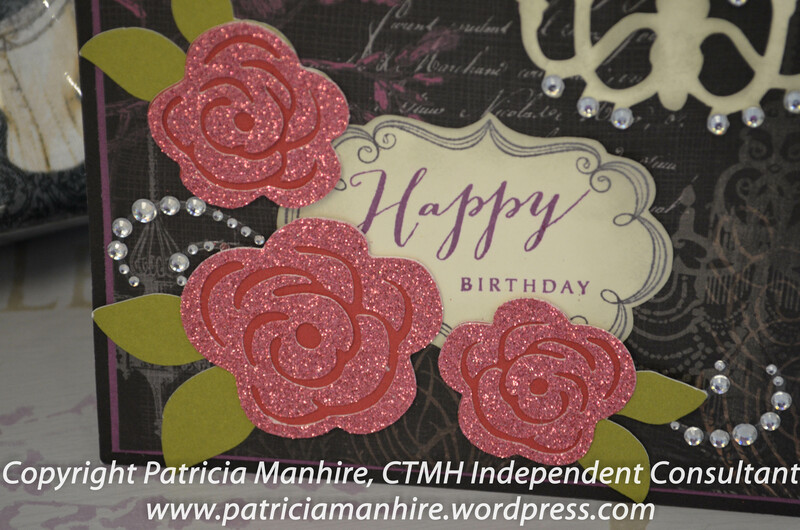 The sentiment is from the Happy to Be Friends stamp set. I have added some small sparkles flourishes which are no longer available. 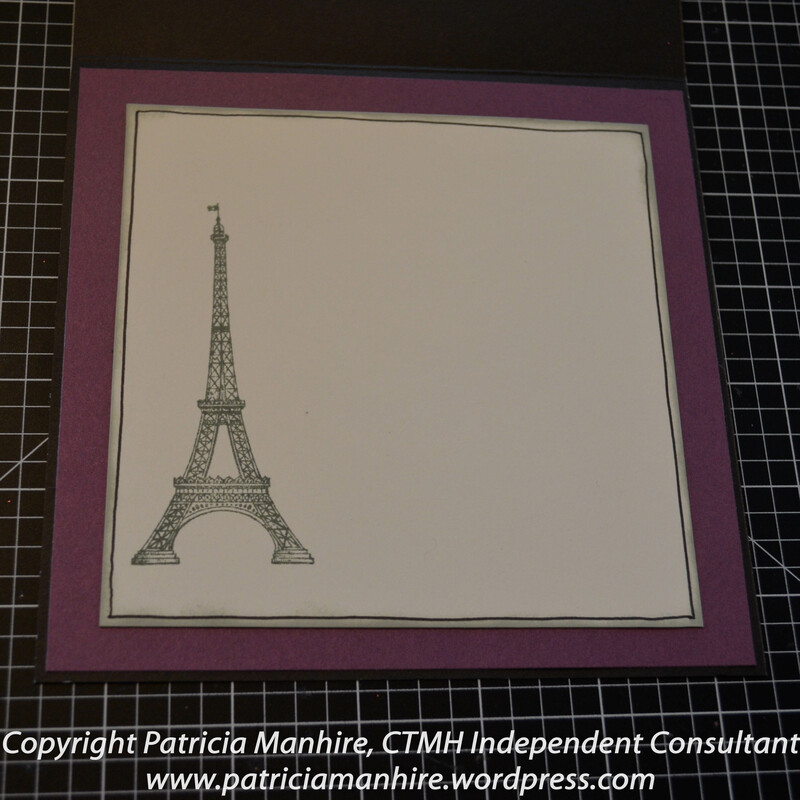 For the inside I have cut a piece of Colonial White cardstock 5 3/4″ x 5 3/4″ and stamped the Eiffel Tower from the Armour stamp set (NLA) on the left side. The edges have been sponged with Whisper ink and I drew the line around the edge freehand with the Marvy Uchida Le Pen to follow through with the French theme. 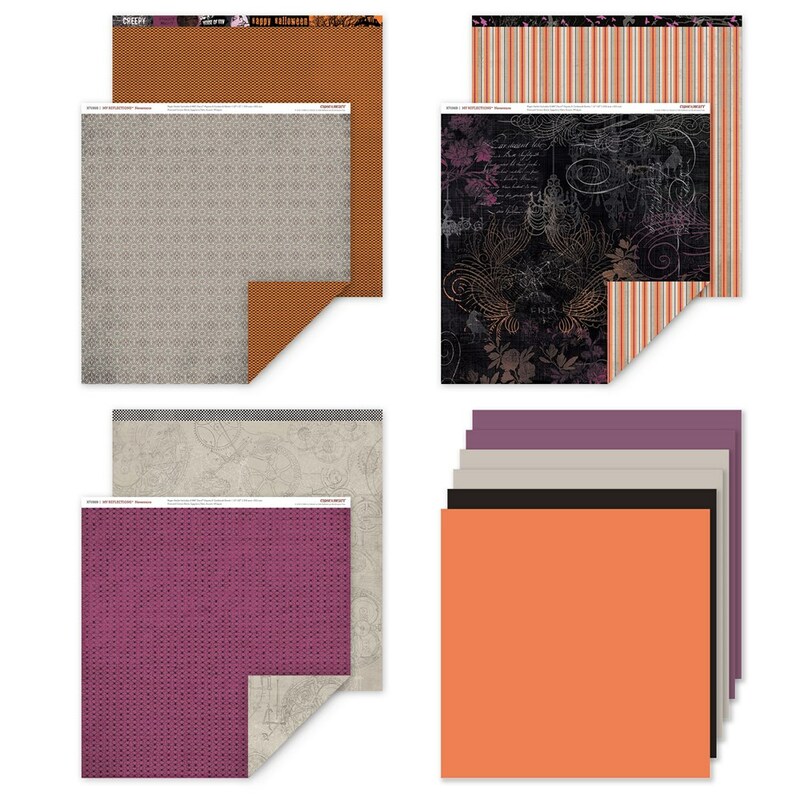 The gorgeous Nevermore paper is now available from the new Annual Inspirations catalogue and will be for the next year from your CTMH consultant here. I’d love you to leave a comment before heading off to the next stop, Vandra’s blog, Vandra’s Virtual CTMH Blog to see what wonderful creations she has made.